Sometimes a film comes along that really has no place on my blog and yet something about it makes me want to include it. Samurai Cop 2: Deadly Vengeance comes 25 years after the original cult classic and features many of the same actors reprising their roles. I have never actually seen Samurai Cop but believe it to be whether purposely or accidentally a film so bad that it's good. From what I could piece together it is 25 years after Joe Marshall (Mathew Karedas) and his partner Frank Washington (Mark Frazer) stopped a notable Yakuza gang from taking over the city. Now while investigating a series of odd assassinations Frank discovers the gang may be back. His investigation leads him to Joe who has been in enforced solitude ever since his girlfriend was murdered at some point in the past. It is not always necessary to have seen the first in a film series but here I really feel I have missed out, I just could not follow the story at all, it seemed to make no sense whatsoever. I think there were two rival Yakuza gangs but their members seemed interchangeable, I think Joe's girlfriend was killed far in the past but am unsure, while the actual plot that leads up to the finale went totally over my head, had no idea what on earth was going on. There seems to be some bits of plot that happen on VHS tape with character literally watching themselves in other scenes, while a romance sub plot came out of nowhere and I'm not even sure how it started. Samurai Cop 2 was funded via crowd funding sources and so this is a film made for it's pre-existing fans. There are a load of character reprising their original roles and a few fun appearances from more well known actors. Main bad guy is Linton played by Tommy Wiseau (notorious for cult train wreck The Room), while in neat cameo appearances we get legendary cult movie villain Mel Novak (Black Belt Jones, Bruce Lee's Game of Death, and Chuck Norris's An Eye for an Eye) and noted actress Laurene Landon (Hundra, Maniac Cop 1 and 2). There are a load of characters here, even with many getting title cards when they first turn up I just couldn't keep tabs on who was who. A lot of the main cast are females, there is a fair share of head strong capable females, though they for the most part are made to wear skimpy clothing and be at least half naked at some points. For the most part male vs female fights play out similar to the man on man fights so that at least was kind of refreshing. It must be hard to purposely set out to make an awful film that can be enjoyed for that reason, it is best for that to happen naturally but here that could not be the case. The acting is all terrible which actually works well, can't say there is anyone who seems good at the craft which makes for some decent scenes of over acting, I even laughed out loud on a few occasions. When it comes to the fight scenes though a lot of Samurai Cop 2 is pretty legitimate featuring some not bad choreography. ones with vast groups of people fighting are the most satisfying to watch. Scenes of Joe training with his samurai sword were also interesting to watch. I had hoped for some ridiculous special effects but instead a lot of them are very CGI based, blood in particular is all CGI, some put to humorous use such as a character who is dying and has a solid river of blood pouring out a wound in her body for a couple of minutes but not a patch on goofy practical effects. 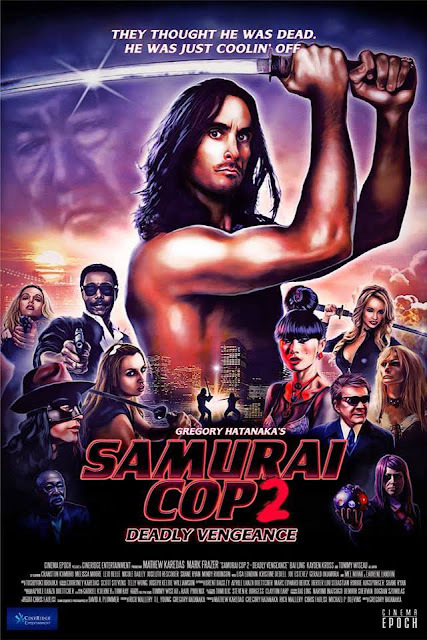 While for me Samurai Cop 2 was an average film with a nonsensical plot I do feel if you have any attachment to the first at all then this is well worth a watch, I would even go as far to say add on a couple of zombie heads to my score as I just felt lost and confused which did mar my enjoyment somewhat though this is a hard film to dislike as I couldn't say it was ever boring.